Post from Transformation Tom- Build and Maintain a Strong Résumé: Chapter from "The Transformation of a Doubting Thomas"
If you are looking for a job, résumés can be the difference between getting your foot in the door and getting a rejection letter without being granted an interview. 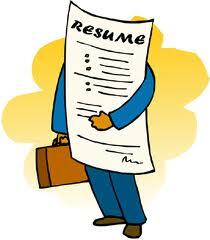 Résumés are, at times, our first and only impression on a prospective company or new position. The importance of an effective résumé is typically not lost on those seeking a job. However, what about people who already have a job? Unless you work in a small company where you know everyone, a résumé works the same way by allowing others to get to know you professionally. You should always have an updated résumé ready. The practice of building and maintaining a strong résumé is not always related to active job searching. The routine of keeping an updated résumé is to eliminate surprise pressures when something of interest does come up or someone wants to get to know you professionally. A prepared résumé that can be instantly obtained shows your preparation when someone may ask for it. This has happened to me more than once. It also ensures that you stay up to date and not forget about including key accomplishments. If a question comes up relating to recent accomplishments, you are ready to share instantly and are in a position for effective networking conversations. I have seen far too many people scrambling to put together a résumé because they were caught off guard. Résumé writing is a skill that can be taught. When preparing a résumé, the key is due diligence and constant review. A résumé should always be considered a work in progress. There is no better tool in your arsenal than a résumé as a way to express yourself professionally in writing. With that said, I have seen résumés that were slapped together quickly with very little thought. I have also seen people pay a lot of money for someone else to put together a résumé that ultimately looked like it was put together just as quickly. If you are going to pay someone, be an active part of the process. No one knows you better than yourself. If you invest the time and get the right support, you will be proud of the work of art you put together. A résumé is potentially a one-time shot to make that great first impression. You can’t afford to submit a document with spelling errors, with glaring grammatical errors, or a poor overall layout. The amount of time invested in a résumé is obvious. Often, readers are turned off because of the lack of visual stimulation and obvious errors as they glance over the information. This can occur before they even begin to read the content in detail. How a résumé presents itself on the page tells a very big story about you. Effectively organized résumés should point the eyes of the reader to the right places to help with the flow and readability. The appropriate investment ensures that it is the best-quality story possible. When is the last time you touched your résumé? I review mine quarterly and I am not shopping for a job. I have a recurring appointment that pops up on my online calendar. After the initial investment to put the full document together, I invest about five minutes per quarter into maintaining it. I learned early in my professional life not to have a dusty résumé. Growing up with a father with over twenty-five years of Human Resources experience with Sears Roebuck & Co., and my subsequent twenty years of interviewing job candidates taught me to always be prepared. My analysis on retaining employees, my recruiting experience, and interviewing has allowed me to see hundreds, if not thousands, of résumés. The following are tips to help you to build and maintain a strong résumé. Style. There is no right or wrong style. The Internet has plenty of websites dedicated to résumé styles and formats. I have yet to find two that are exactly alike, which should clearly tell you there is no magic formula. However, while there is no right or wrong, there is still a first impression. Bullets versus sentences. I personally think it is a preference and that it doesn’t matter as long you are consistent, clear, concise, and succinct with your information. Use of effective spacing and layout. Proper spacing and open areas on the document grab attention. Don’t crowd the document with words. Use the open areas to your advantage to ensure that key items catch the attention of the readers and point their eyes to the key words/places on the document. Hesitancy in sharing. Go out there and share it with everyone. There are a couple of reasons for this. First, you need a third party’s opinion and proofreading skills. Another set of eyes is a must. I had someone review my résumé recently and she found an extra space that had been there for years. Second, share your résumé for networking purposes. Having your résumé floating around is not a bad thing when it gets into the right hands. You will also surprise some readers who may not know all of your background. The only assumption you should make with a résumé is that no one knows you. Editing. Running spell check doesn’t count as editing. Enough said. Routines. Have a recurring calendar appointment to update your résumé quarterly. No need to think about it, just do it. Jargon. Match your résumé language and headings consistent to job descriptions, but avoid internal jargon. You can use language familiar to people in your company if you are using your résumé internally, or use similar language to a job advertisement you are applying for. For example, if you have a sales background and you are pursuing a marketing position, use terms such as “Marketed products to…” However, when possible, I try to minimize the amount of changes by staying broad enough with your terminology that both internal and external readers can understand it, so you only need to maintain one document. In large companies, you also can’t assume people in different departments are familiar with all internal terminology. Be specific. Assume the people you may be speaking to do not understand your past jobs or responsibilities. Be specific. Even if you are meeting with someone who is familiar with the job description, use specifics on your résumé that differentiate you individually. Use statistics. Job descriptions should include powerful information that shows the size and scale of your responsibilities; numbers can be insightful (e.g., Collected on 5-million dollar portfolio, exceeded goal by over twenty-five percent for twelve consecutive months). Dollars and percentages visually stand out. Word choice. Avoid support language (e.g., Assisted…) and use language that shows your leadership (e.g., Created, Directed, Prepared, Piloted, and Developed). What makes you special? Use differentiating accomplishments and descriptions. What makes you unique? Go beyond the duties and tasks of the job. Order of facts. Key points should be prioritized in the job descriptions. For example, “Managed as many as fifty people” should be placed ahead of “Maintained timesheets” in your job assessment. Final document. There is no such thing. Your résumé is a fluid document. You need to adapt it regularly and as needed. Outside experiences. Include assets and experiences that may not have a direct link to the job in which you are interested, but show differentiating and special features. A friend of mine had a résumé that didn’t list his Military reserves experience. Not including these details instantly neglected over fifteen years of critical leadership, commitment, and service to our country. Volunteer work. Don’t forget to include your volunteer activities and other skills, regardless of what you are interested in. Volunteering shows you can balance time and responsibilities and shows you give back to the community. How personal? Include personal items if they strengthen your cause. For example, you may add something like, “Perfect attendance five consecutive years,” and “Excellent health—run twenty miles per week.” Both examples differentiate you from a typical résumé and show that you will come to work energized and ready every day. Another example might read, “Married for fifteen years.” Although employers can’t discriminate or even ask questions based on your marital status or health, it proactively rounds out your full story and shows more personal differentiation and stability. Sequence of events. The most common formats are chronological and skills-based (e.g., jobs, volunteer work, and training). Just like résumé styles, this can come down to personal preference, unless you have done your homework and found that your company of interest has their own preferences. If you don’t have a résumé, or have not touched your résumé in the last three months, pull it out and start today. You never know when you will need it. Make it a work of art.